If you like to plan ahead with your finances and prepare for big ticket items and expenses, now is the perfect time to start planning for the holiday season. Your spending may vary depending on what you need to buy and who you need to get gifts for, but it’s better to prepare for a more expensive next few months instead of convincing yourself that you’ll stay within your budget. Preparing your finances for the holiday season is easy as long as you stay organized. 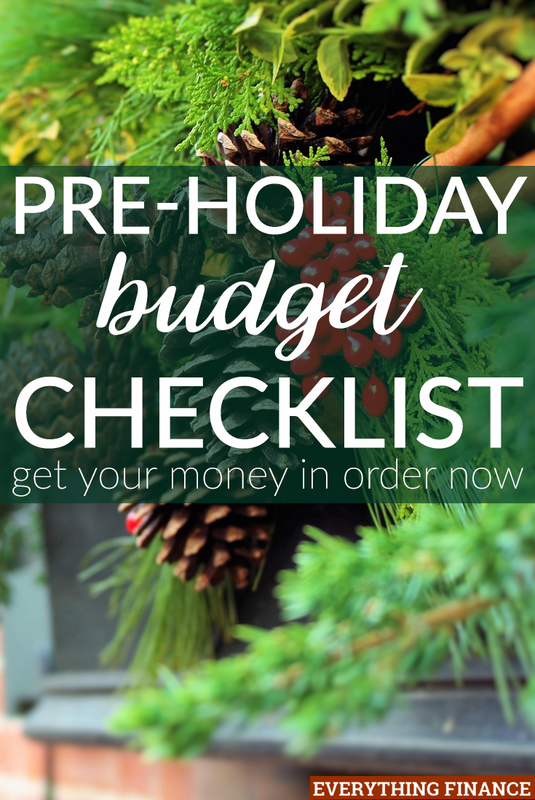 Here is a pre-holiday budget checklist to consider as you plan everything out. The first thing you need to do is figure out what your extra expenses will be over the next few months for the holiday season. Will be you hosting or attending any holiday-themed parties? Will you be going on any traditional outings that may cost extra money? Who do you need to purchase gifts for? Will you be doing any charitable giving? You should ask yourself all these questions and start to organize a list of potential expenses so you can start to prepare for them. Once you know what your expenses will look like, you’ll need to determine how much you want to save. Saving up for the holidays is key if you want to avoid getting into debt and spending more than you earn. Set up automatic transfers from your checking account to a savings account and you can even separate the money into different categories like “kids’ gifts,” “parents’ gifts,” “holiday dinner,” etc. Capital One 360 is a great online bank that allows you to open up to 25 different savings account and label them whatever you want to stay organized. Your savings list may look different, especially if you are planning any holiday travel or have other interests or responsibilities. Your estimated expenses might sound like a lot when you add everything up, but you can always make adjustments. Coming up with $700 is not a walk in the park for me, but that’s why I’ve started saving early. In anticipation of increased spending around the holidays, you can begin to lower your expenses so you can save more. It’s pretty easy to be frugal during fall and find cheaper ways to do things, and this can give your wallet some much needed down time. Another way I like to work on lowering some of my expenses is to pay down more of my debt before the holidays. While I never like to skip a payment, it gives me a sense of relief to know that I’m paid ahead. I wouldn’t receive a penalty for skipping a payment in December if unexpected expenses arise toward the end of the year. If you know you need to earn more money to cover holiday expenses, you can always pick up a side hustle to earn extra money. My husband recently started driving with Uber and is going to use some of the money he earns from trips for holiday expenses. You can also see if you can get a seasonal job at a local store since retailers are always super busy for the holidays. Also, don’t forget about work from home side hustles like freelancing, babysitting, and even selling items from your home. If you are creative, you can even start an Etsy store and sell homemade products as gift ideas for others for the holidays. If you have any loyalty rewards, credit card points or cash back, now is the perfect time to cash those things in and apply them toward your holiday spending. If you have cash back or credit card reward points, they can come in handy if you are planning any holiday travel or want to purchase gift cards for other people. I received a few gift cards last year and held onto them so I could apply them to my Christmas spending. Since I have about $200 in gift card money, that means I only need to come up with $500 to meet the remainder of my holiday expenses. Like I said before, now is the perfect time to start preparing your finances for the holidays. Getting an early start will help you stay organized and avoid unwanted holiday debt. No one wants to go into the new year with spending guilt and debt from impulse purchases. Use this holiday budget checklist to improve your finances during the most expensive months of the year. Have you started preparing your finances for the holidays yet?